SUBHEAD: His administration expects the planet is going to experience temperature rise of 7ºF and doesn't care. 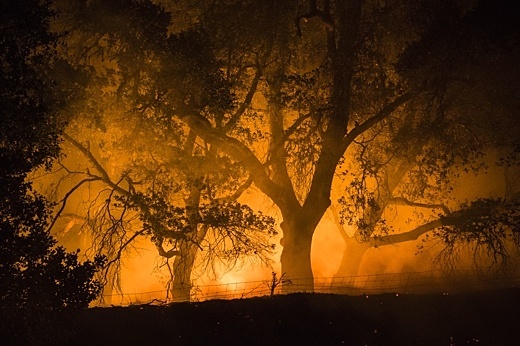 Image above: Trees silhouetted by flames in recent out of control wild fire in California seen in Washington Post article dated 9/28/18 titled "Trump administration sees a 7-degree rise in global temperatures by 2100". From (https://www.washingtonpost.com/national/health-science/trump-administration-sees-a-7-degree-rise-in-global-temperatures-by-2100/2018/09/27/b9c6fada-bb45-11e8-bdc0-90f81cc58c5d_story.html). The news in that statement is that administration officials serenely contemplate that 4C rise (twice the last-ditch target set at the Paris climate talks). Were the world to actually warm that much, it would be a literal hell, unable to maintain civilizations as we have known them. But that’s now our policy, and it apparently rules out any of the actions that might, in fact, limit that warming. You might as well argue that because you’re going to die eventually, there’s no reason not to smoke a carton of cigarettes a day. But the link goes much deeper. Most of those migrants are from Central America and Mexico, and they might as easily be described as refugees fleeing gang violence (much of it rooted originally in the US) and a changing climate. Guatemala, El Salvador and Honduras first saw an outbreak of coffee rust linked to higher nighttime temperatures; the El Niño that began in 2015 led to years of unprecedented drought. Deep new droughts this summer wiped out more harvests: “total or partial loss of crops means that subsistence farmers and their families will not have enough food to eat or sell in coming months,” the UN’s Food and Agriculture Organization warned. This will, of course, get steadily worse in the years ahead – every climate forecast shows deserts spreading and water evaporating across the region. And of course more migration will follow, in every corner of the world. Some of that migration will be internal – perhaps six million people will abandon their coastal property in Florida alone, according to recent reports. And much of it will be international, as people flee because their lives depend on it. And telling people to stay home is not a moral option, either. Because the climate chaos setting off waves of refugees is born above all from the unconstrained migration of carbon dioxide molecules from America over the last century. No wall can prevent the exhaust from our armada of oversized cars from raising the temperature in Mexico; if Guatemala could ship its changed climate back north it doubtless would, but it can’t. We have to realize that global warming stems from the fact that we are a world without atmospheric borders, where the people who have done the least to cause the problem feel its horrors first and hardest. That’s why, over the last half-decade, the environmental and migrant-rights movement have grown ever closer. The Trump years are a fantasy land where we pretend we can go on living precisely as in the past, unwilling even to substitute electric SUVs for our gas guzzlers, and able to somehow insist that the rest of the world stay locked in place as well. It’s impractical, it’s unfair, and when it ends up with camps for kids in the desert it’s downright evil.